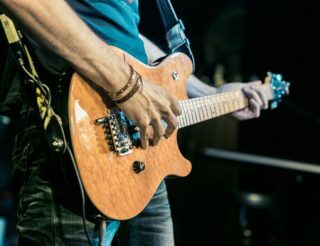 In this article I’ll be showing you some simple yet effective ways to use chord inversions. 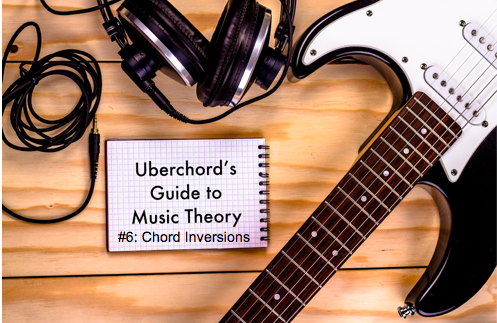 If you missed Uberchord’s Guide to Music Theory #6: Chord Inversions, we recommend reading this first so that you fully understand the theory behind chord inversions before you start to get creative. Before we start discussing the best ways to apply inversions to common chord progressions, I want to share with you some thoughts on chord inversions and the way they sound. Not only does the overall character and sound of the chord change, but so does its function, once you start inverting it. Understanding this will make your playing infinitely more interesting. Notice how B D G sounds less “stable” than G B D? D G B, however, sounds quite “solid” and this chord inversion, called the second inversion of a triad, is according to some music theorists the strongest inversion. 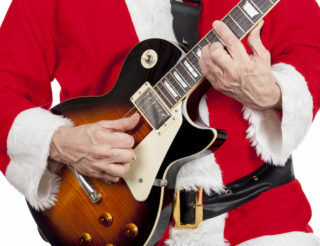 In fact, if you take any power chord (say, G5, which only contains the notes G and D) and invert it so as to have the fifth as the lowest note, you will get a heavier sound. This is why I think it’s worth learning to identify the unique sound of every inversion. 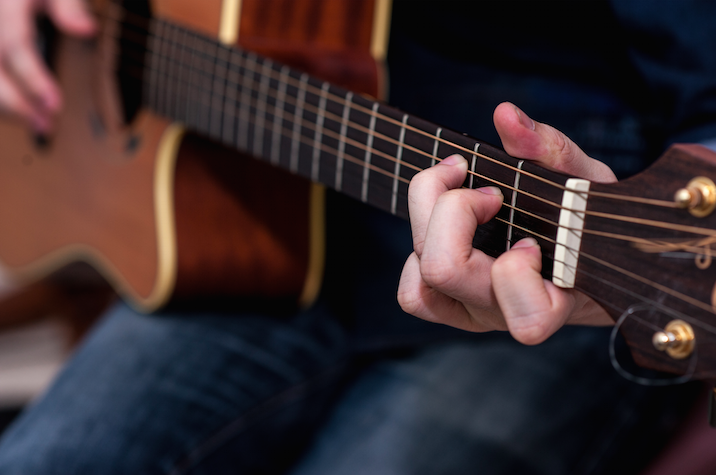 Here’s another thing you can do: play any chord both in the root position and in its two inversions and try to assign certain impressions to the sound of each inversion. 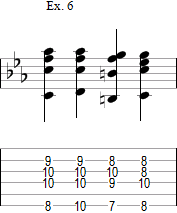 The following example uses G minor, played in triads in closed position. 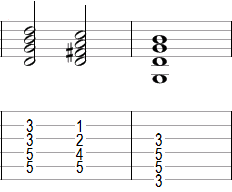 As you may know by now, there are chords that have more than 3 or 4 notes in them, but also 5, six and even 7(!) notes. 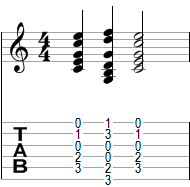 But truth be told, inversions of chords that contain more than 5 notes are rather rare. Something that happens with certain chords that contain 4 notes is that their name and function will change. 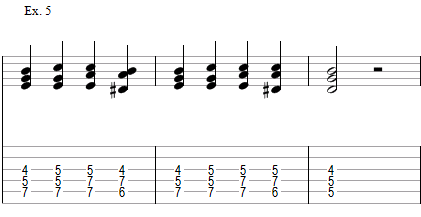 One of my favourite examples are minor sixth chords. The third inversion of Gmin6 happens to be Emin7b5 in its root position. Now, if you take a look at the notes involved in the both you’ll probably recognize the Dorian mode in G, or the Locrian mode in E. To me, both chords point at the key of D minor, and the fact of the matter is that both chords will resolve towards the dominant chord of that key, which is A major, or rather A7. One of them, however, has a stronger effect. D E G B –> Major second between the lowest notes. Okay, now that we’ve had a look at how exactly inverting chords changes the sound, lets put this into practice! 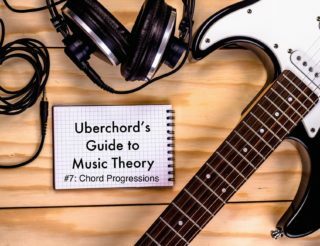 In the following section I’ll simply show you how using chord inversions can make the same chord progression sound quite different. It is worth mentioning that several of the basic chords we learn at the beginning (so-called “campfire chords”) are chords in open position. Most of them are also in their root position. But by playing chords in this fashion we miss out on the opportunity to explore the more melodic side of a chord progression. One classic example of how versatile inversions can be is the intro to “Stairway to heaven”. 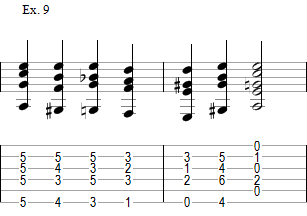 The chords are Amin, Caug7 (or Emaj, depending on the tab…), Cmaj, Dmaj and Fmaj7. If you were to play these chords in their root position, the melody implied by the chord progression wouldn’t be possible. By inverting the chords, Led Zeppelin was also able to create a cool effect by contrasting a descending bass line (A G# G F# F) with the melody on top, contributing to the psychedelic vibe of the song. Remember that you may either organize the notes of a triad in a close position or a spread voicing. 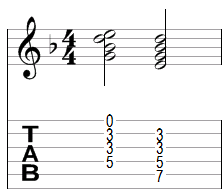 Chords in a closed position tend to sound dense. Spread voicings allow for some space between the intervals that constitute a chord and allow for better voice leading. Let’s start by implementing chord inversions in simple chord progressions. I’ll be using Roman numerals so that you can transpose these examples into other keys of your liking. Refer to the video to get an idea of what the examples sound like. Consider a simple I V I turn around in C major consisting of the chords Cmaj Gmaj Cmaj. Compare how much the sound changes across the different examples. At the beginning of the video you see me play the turnaround using our usual chords. 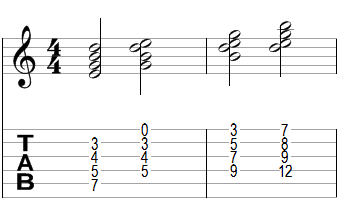 The following examples illustrate different ways to play the same turnaround. Notice how inversions make the I V I sound more melodic than it did when played using regular chords. 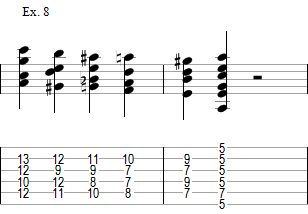 …and these are alternate ways to play the turnaround, using inversions. Something that inversions allow us to do is to have a bass note that is more or less static, as seen in the example above. 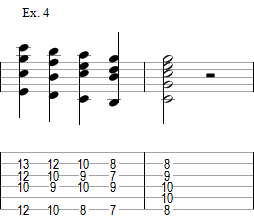 Since the i VI and iv chords all contain the tonic (E, in this case) either as a root, third or fifth, E is in the bass, going one step down towards the leading tone (D#) for the V i cadence. The tried-and-true i VI iv V chord progression would sound quite different if we were to avoid using inversions of the chords involved. Realize that inversions generate movement, and a phrase or a section is unlikely to end with a chord in the first inversion. Let’s make things more interesting by having some movement in the lower register of the guitar. 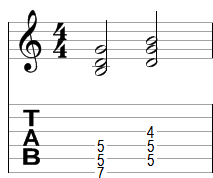 A cool thing you can do is have more movement going on in the lower strings, particularly the sixth string. This is achieved by means of spread voicings, which in my opinion are a good exercise in arranging, as you can see the lower lines as the part the bass would normally play, while the high notes are what other instruments will take charge of. 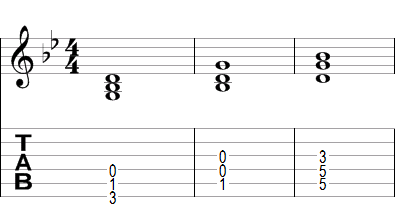 The following example shows a Latin-sounding chord progression that makes use of borrowed chords. Both ex. 9 and 10 are modifications of that chord progression. 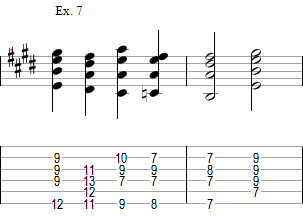 This time we replace some chords and even use a so called “Lament bass” in Ex. 10. It is worth mentioning that all of these examples aren’t what I’d call good voice leading. My former harmony teacher would kill me if he saw them, but you get the idea. Feel free to experiment and explore. 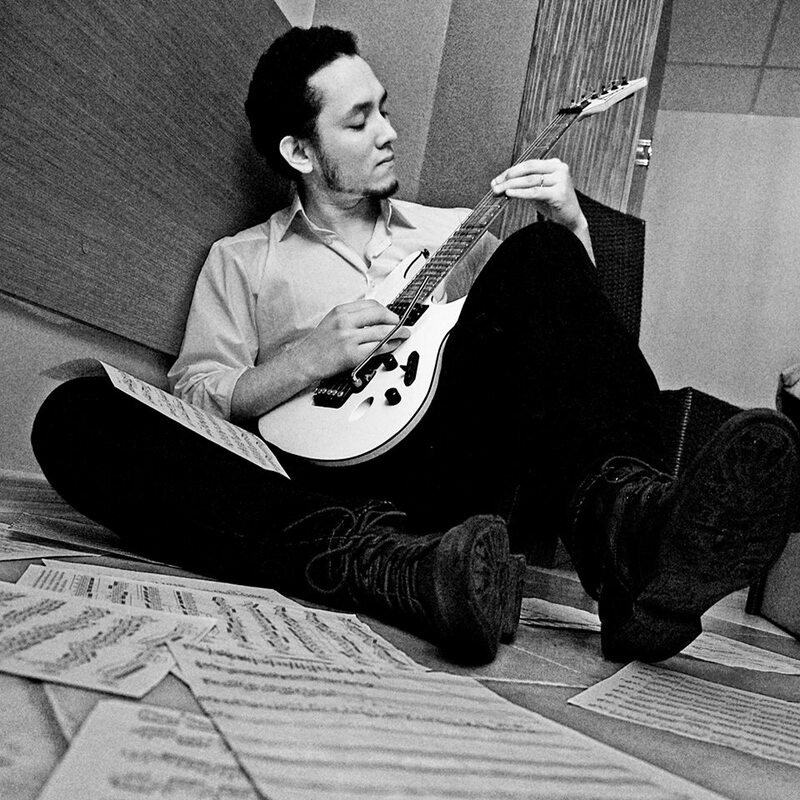 Take any chord progression from a song you know or even better, from a song you’ve written on your own and give it a different vibe and feel by using inversions, descending or ascending bass lines and whatnot. 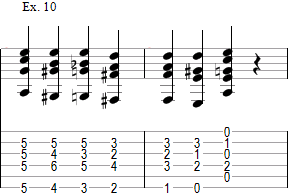 You may play just the triad as it is or duplicate certain notes in them, just like we usually do when we play chords. I suggest starting with just the triad so as to avoid confusion. Add more tension notes as you go. You’ll soon notice that there is a lot that inversions allow you to do. We’ve only just scratched the surface. I hope you enjoyed my lesson on Chord Inversions. If you want to see more, please check out other lessons by me on my Youtube, follow me on Facebook and watch some of the videos I’ve got there. If you want to listen to my own music, feel free to check out my Soundcloud page.